The new and improved time tested Kenne Bell BOOST-A-PUMP powers some of the worlds most powerful production street and competition vehicles. Kenne Bell supercharger kits all use the BOOST-A-PUMP to reliably produce those big HP numbers - on pump gas! It activates only at full throttle or boost, so it doesnt bloat or overload the fuel system at idle or cruise where full time pumps and extra fuel are not required. So, the fuel isn't heated (gasoline begins to boil at 95). No cool can is necessary, and it's much easier to install (cut one wire) and more reliable than twin fuel pumps. While dyno and street testing, our On Board Data Logger told us that fuel flow was less at night when the lights, stereo etc. were on. The voltage to the pump was varying between 12 and 13.5 volts and fuel was being reduced up to 15%. Further testing in our Fuel Flow Lab indicated that by elevating the voltage to the pump we could safely increase fuel capacity by as much as 50%. 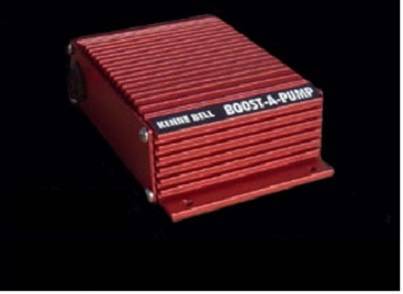 Shipping: FREE continental USA ground shipping on ALL Kenne Bell Boost-A-Pumps! Shipping Remarks: FREE continental USA ground shipping on ALL Kenne Bell Boost-A-Pumps!